There are several reasons why collectors value Mission furniture so highly. In addition to its characteristic simplicity, it offers exceptional quality thanks to an emphasis on the use of real hardwood and traditional construction techniques. While many of today’s big furniture companies offer pieces that replicate the outer appearance of Mission styling, few achieve its level of quality. AmishOutletStore.com offers Mission-inspired furniture that’s true to both the form and the function of the genuine article. 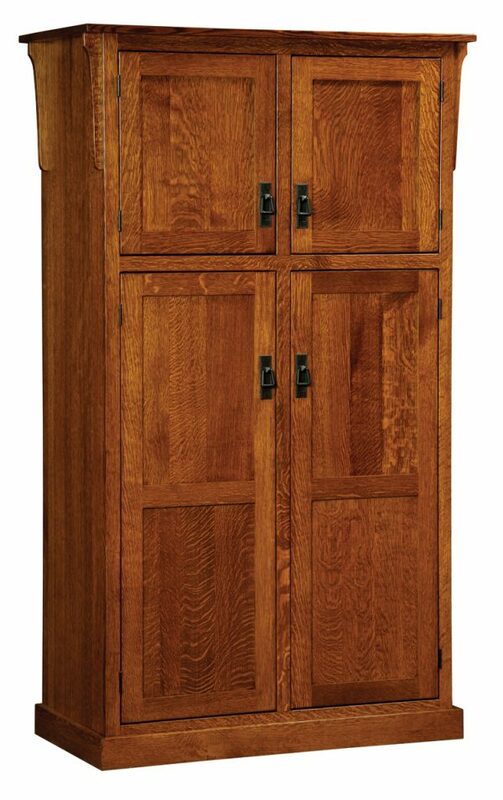 Our 4-Door Mission Pantry is handmade in the United States by artisans who use traditional materials and techniques. 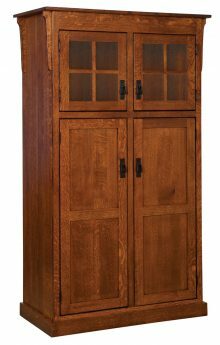 The piece is available in your choice of oak, brown maple and several other hardwoods and can be stained to order in the color of your choice. Though you’ll pay more initially for our products than the national department store brands, in return you’re getting a piece that’s built to a standard of quality that is rare today. It’s not uncommon for our furniture to remain in the home for generations. The Mission pantry measures 42″ W x 20″ D x 72″ H and features reverse paneling and a set of four adjustable shelves. It is a highly attractive place to store any item and makes a natural centerpiece in a bedroom, dining room or kitchen. Pair it with other items in our inventory or with more contemporary pieces. We offer a large order discount program that delivers additional savings the more you spend. 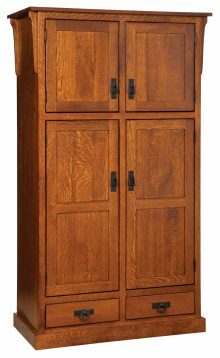 Buy our 4-Door Mission Pantry as part of a set and get up to 33% off the retail price of your order. To learn more, contact an AmishOutletStore.com representative by phone or email.